Remember the days before smartphones? 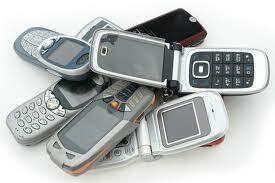 When normal mobile phones could only send short text messages? Was it the short messages or the sheer frustration of having to tap a key several times to use the letter you wanted which led to the abbreviation abomination known as txt-speak? I suspect it was a bit of both. Even in those early days, I resisted using abbreviations such as 'u' for 'you'. Whenever possible, I spell words out. I may, on occasions where I'm in a tearing hurry, send a text along the lines of "Ok, c u!" but oh dear, it's just not me. My pet hate in txt-speak is using 'ur' for 'your'. Ur was a city in ancient Mesopotamia. That's the first thing I think of when I see 'ur' in a text message or email. In high school we had a passionate Ancient History teacher whose name escapes me, but I can see her now, small and dark, vigorously gesturing as she spoke about Ur and the Tigris and Euphrates rivers. She could see them in front of her, smell the smells, feel the desert heat, and she tried her best to bring it all to life for a classroom full of vaguely disinterested fourteen year old girls. So. I was fourteen and ur was Ur. Pronounced Err. If I wanted to abbreviate the word 'your', I used 'yr'. 'Yr' was used extensively by Jack Kerouac and the beat generation in the late 50s, and the use of 'yr' for 'your' goes back to the late 1700s. Confusingly, 'yr' is also a modern abbreviation for 'year', but unless you are extremely thick, you'll realise which context of 'yr' people are using when they write to you. I confess to using abbreviations such as LOL, BRB etc on Facebook and social media. Heck, I even speak LOLspeak, that feline language created by the Cheezeburger people. The English language is forever changing (unlike French, which is strictly controlled by l'Academie Francaise), and the way we speak and write reflects that. I'm happy to embrace change, but to a point: I have never used 'ur' for 'your', and I never will. I just find it offensive to my psyche. I'm a dinosaur. I suspect in fifty years time spelling and even grammar won't matter for the majority of people; we will be a society dependent on computers who will happily spell and correct for us. If I'm still around, you can bet I will still be resisting using 'ur'.